In the month of April 2016, the results of OUE Hospitality Trust rights application was announced. OUE Hospitality Trust Rights was over subscribed. (Refer to OUE Hospitality Trust Rights Issue Over Subscribed) I managed to get my allocated units and a portion of the excess rights I applied for. 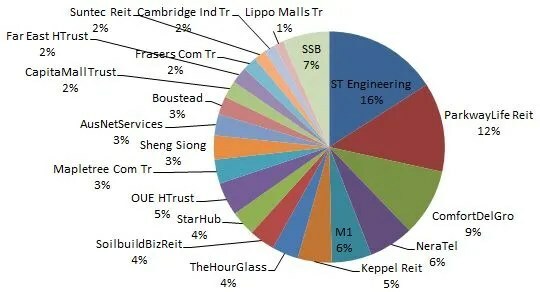 Thus my holdings for OUE Hospitality Trust increases from 3% to 5% of my stock portfolio. The market was on a bull run in the month of April as many companies and REITS announce their financial results for 1Q2016. A few stocks I have in my watch list rallied. Examples are ARA Asset management which went as high as S$1.27 before retreating to S$1.19. Thai Beverage went from S$0.715 to S$0.75. At the last week of April, the Straits Time Index (STI) retreated due to announcement of poor U.S. GDP (Growth Domestic Product) data, blamed to weak business spending. I am holding on cash with caution. The Singapore stock market looks expensive now and as a dividend investor, the yields of most stocks I am watching does not appeal to me. I am exploring into the Hong Kong stock market as better yields can be found there. Hong Kong stock market is full of “land mines” and having burnt a few times in my earlier investing days, I am trading with caution. Lastly, Happy Labour Day and enjoy your long weekend.